This game is going to be in London. Old school AFC West showdown before Seattle moved to the NFC. The Raiders are not that bad of a team; things are just not clicking for them. They were in a few of their games with a chance to win, but they have came up short. Similarly, the Seahawks have also lost some close games. Two west coast teams traveling to Europe is going to be challenging, but this game should be really fun to watch. Great game today from the guys. 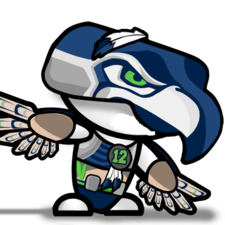 Everyone playing hard and the Seahawks are now 3-3. Still have plenty of life for the wildcard spots. Everyone played well today, but Wilson took at least one sack in the 3rd quarter because he was holding onto the ball forever. Really needs to clean that up moving forward. Frank Clark, PAY THE MAN! This game was won in the trenches, with both Seattle units dominating the LOS. How much would you guess his contract would be? 14-17 million? Just going off current 4-3 End contracts.